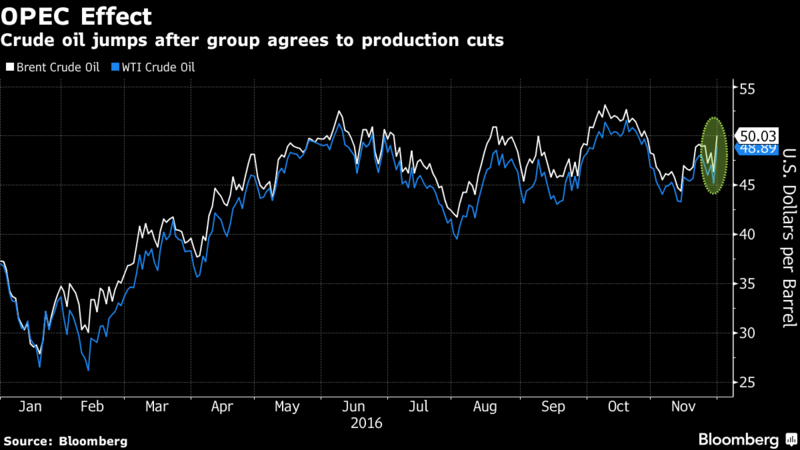 OPEC clinched a deal to curtail oil supply, confounding skeptics as the need to clear a record global crude glut — and prove the group’s credibility — brought its first cuts in eight years. Crude rose as much as 8.8 percent in London. OPEC will reduce output to 32.5 million barrels a day, Iranian Oil Minister Bijan Namdar Zanganeh told reporters in Vienna following a ministerial meeting on Wednesday. The breakthrough deal, effective January, showed an acceptance by Saudi Arabia that Iran, as a special case, can still raise production. The Organization of Petroleum Exporting Countries is ditching a pump-at-will policy introduced in 2014 to resume its traditional role as price fixer. The shift — aimed at draining a crude glut that’s pushed down prices for two years — will help revive the tattered finances of oil-producing countries and will reverberate in markets around the world, from the Canadian dollar to Nigerian bonds to U.S. shale equities. 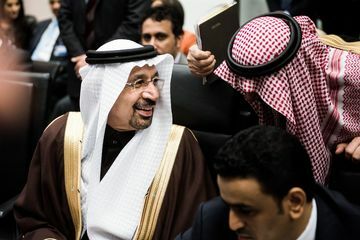 The agreement, which also calls for a reduction of about 600,000 barrels a day by non-OPEC countries, pushed up Brent crude by as much as $4.08 to $50.46 a barrel. Still, prices remain at half their level of mid-2014. The United Arab Emirates and Kuwait will reduce output by 139,000 barrels a day and 131,000 a day respectively, the document shows. Non-member Russia, also pumping at a post-Soviet record, will cut by as much as 300,000 barrels a day “conditional on its technical abilities,” Energy Minister Alexander Novak said in Moscow. The strength of the deal will depend on whether all parties deliver on their commitment. Saudi Arabia and its Gulf allies the U.A.E. and Kuwait have traditionally stuck to their cuts, but some others haven’t, particularly when prices are low. Any doubt in the market could once again see prices come under pressure.